SpectreVision and ACE Pictures announced today that principal photography will begin next month on Richard Stanley's HP Lovecraft adapt Color out of Space. Starring Nicolas Cage, the film will be directed by Stanley, his first feature in over twenty years! Based on the novella by H.P. Lovecraft, COLOR OUT OF SPACE will reunite Cage with SpectreVision, the company behind the critically acclaimed MANDY, the sophmore feature from Panos Cosmatos. The film will also star Joely Richardson (RED SPARROW), Tommy Chong (UP IN SMOKE), Elliot Knight (DC’s Titans), Julian Hilliard (The Haunting of Hill House) and Q’Orianka Kilcher (The Alienist). South African filmmaker Richard Stanley started his career with back-to-back cult classics like the cyberpunk horror film Hardware and Dust Devil, before being released from the notoriously controversial 1996 production of THE ISLAND OF DR. MOREAU with Marlon Brando and Val Kilmer, an event chronicled in the 2014 documentary LOST SOUL: THE DOOMED JOURNEY OF RICHARD STANLEY’S ISLAND OF DR. MOREAU. In the 60 years since his passing, H.P. Lovecraft has come to be widely acknowledged as one of the most influential voices in American literature, and his work has spawned a multi-million-dollar industry with a truly global fan base. His influence and cult standing have inspired ranks in the horror echelon from Stephen King, Guillermo Del Toro, John Carpenter, Ridley Scott, J.J. Abrams, Sam Raimi, Stuart Gordon and many others. 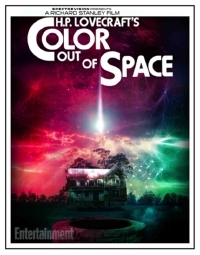 COLOR OUT OF SPACE is a story of cosmic terror about The Gardners, a family who moves to a remote farmstead in rural New England to escape the hustle of the 21st century. They are busy adapting to their new life when a meteorite crashes into their front yard. The mysterious aerolite seems to melt into the earth, infecting both the land and the properties of space-time with a strange, otherworldly color. To their horror, the Gardner family discover that this alien force is gradually mutating every life form that it touches...including them. Not only is it great to see Stanley back behind the camera after so long, but we've been waiting for a prestige Lovecraft film for a long time too. Oh...wow. I am literally having to sit down and reexamine my whole world view. Or something. Nic Cage in a movie version of one of the greatest SF horror mashup stories of all time? By one of the greatest---if not THE greatest---SF/fantasy/horror writers who ever lived? And then died? Mysteriously and under circumstances so terrifying that it drove local reporters mad? Okay, I made up that last bit. But you get my drift. Either Nic Cage will absolutely reign supreme in this movie, and everyone will be talking about it for decades after as one of the most amazing films ever made, or he will absolutely reign in this movie, and everyone will be talking about it for decades after as one of the worst films ever made. Either way, it's a win-win! Oh boy! it definitely is the best timeline. Stanley+Cage+Lovecraft i'm already losing my sanity. Damn i'm hype !